Lillian Sun’s brother was born when she was in high school, and she credits him with influencing her to attend the University of Maryland. 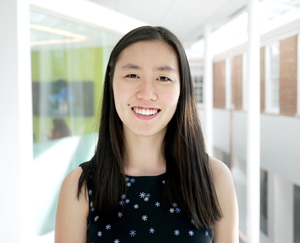 Sun, an Integrated Life Sciences Honors College junior pursuing a double degree in biological sciences and economics, wants to be a medical researcher after she graduates. Sun became interested in economics on her own, but found that it led her back to medicine. Sun’s first experience with medicine occurred during high school when she interned at the National Cancer Institute’s Office of Cancer Complementary and Alternative Medicine. There, Sun screened a library of herbal compounds for potential use in chemotherapy. The experience also grew Sun’s interest in cancer research. From May to December 2016, she interned with Carter Van Waes, a senior investigator at the National Institute on Deafness and Other Communication Disorders (NIDCD). Sun researched the effectiveness of certain antibodies in immunotherapy—treatments that stimulate a patient's immune system—for head and neck cancers. In December 2016, Sun joined the laboratory of Clint Allen, an otolaryngology surgeon-scientist at the NIDCD. In Allen’s group, Sun found a way to make a specific type of immunotherapy more effective in the laboratory by first treating cancer cells with chemotherapy drugs. As a result of her work in Allen’s laboratory, Sun co-authored two papers published in the journal OncoImmunology and submitted two more papers for publication, including a first-author paper. In addition to conducting cancer research in the laboratory, Sun also met cancer patients while shadowing doctors at the National Institutes of Health’s Clinical Center. There, she saw patients recover, but she also witnessed patients finding out that they were dying. Sun plans to apply to a dual M.D./Ph.D. program after graduation so that she can continue seeing patients in the clinic in addition to working in the laboratory. This fits with Sun’s history of helping those in need. As a member of the UMD chapter of the American Medical Student Association from 2015 to 2016, Sun volunteered at a soup kitchen and a food recovery program. When Sun became the association’s co-president in 2017, she led the development of two service programs that promote better nutrition and destigmatize mental illness among UMD students. Sun also founded Terps for New Horizons, a club dedicated to helping immigrants and refugees. In 2017, Terps for New Horizons organized free English lessons for refugee families, complete with rides to campus and child care. The organization also sent a number of blank banners to college campuses including UMD, asking students to fill them with welcome messages for refugees—which they did. The canvases became Project Welcome. Going forward, Sun wants to discover more about how to make cancer immunotherapy more effective. “Dr. Allen is planning a clinical trial, which would be really exciting!” Sun said.